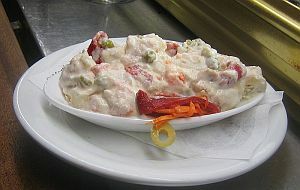 Ensaladilla is more properly known as "Russian salad", simply because it is said to have originated in Russia, specifically the Hermitage restaurant in Moscow. Back in the 1860s, the restaurant's chef, Lucien Olivier, was responsible for its invention, which became so popular that the restaurant adopted it as its signature dish. Thus, it is also known as Olivier salad. Eventually, although the recipe was a jealously guarded secret, approximations of it spread throughout Europe and, these days, a Spanish version is almost without fail found on display in tapas bars. It is eaten as a tapa, or a side dish with something else. In some bars, the waiter will give you a small portion free with your drink (although I've never found one that does that!). As you can imagine, like many other recipes found in Canarian cuisine, ensaladilla has its variations, but the version I'm going to describe here is possibly the most authentic. The method of preparation of this dish couldn't be simpler, as many of its constituents can be shop-bought. There's not much cooking to do! First step, boil the potatoes, checking them occasionally by piercing with a knife. You want them cooked - but not too much. They need to still be quite firm. When they are ready, pour off the boiling water, immersing them in cold water, which you must keep renewing until they're cooled down. A stint in the fridge would be a good idea, too. Cut the potatoes into small cubes, then return to the fridge while you do the rest of the preparation. Place a generous dollop of Mayonnaise into a bowl. Take one of the red peppers and cut into small squares, then add to the bowl. Next, crumble the tuna into the mixture, then add the carrots and peas (after draining off any liquid from the tin). Finally, peel and chop up the egg and add that, too. Everything should then be mixed together thoroughly. Take the potatoes out of the fridge and introduce into the mixture, folding it until all the ingredients are uniformly mixed together. Spoon onto a serving plate, cut the second red pepper into strips and place them on top, as a decoration. Done!